I had planned to have more exciting eats today for dinner, but it didn’t turn out that way. Today was a frustrating end to a stressful week. Work was insane again with lots going on, but I did manage to break away with co-workers for lunch at a Thai restaurant. And an interesting/annoying mix-up happened with my order, I was brought a chicken dish instead of the tofu dish I ordered. The issue was resolved quickly, but I was actually repulsed by the look and smell of the chicken dish sitting in front of me for the few seconds it was there. Not sure if it was because it was not good chicken or because I’ve been avoiding meat for so long now and knowing what I know about the food industry that I couldn’t get that plate out of my sight fast enough. After work, my sister and I had planned to battle rush hour traffic into Sacramento to visit my grandma in the hospital again, then grab some dinner. But the plans fell through and left me waiting an hour for her before learning this and going by myself pretty frustrated. I snacked on a pear and some almonds before visiting which was a good thing because I didn’t have dinner until I got home around 9 PM. Truthfully I was craving a big salty, greasy bowl of popcorn at that point, but decided I could do better and broke out leftovers from last night. 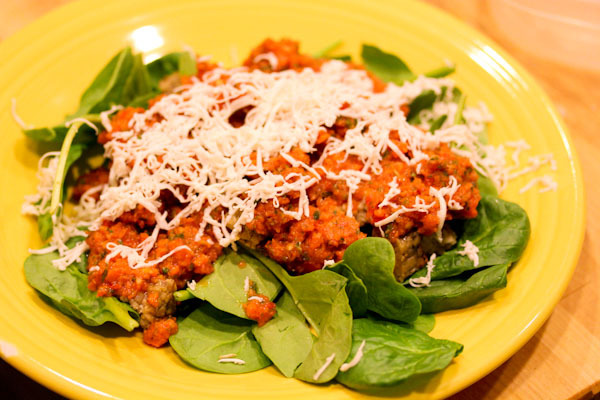 I lazily spread some spinach on a plate, then cold tempeh chunks and layered with the marinara sauce and shredded Mozzarella Vegan Gourmet. See, a repeat dinner is hardly exciting. Though better nutritionally than popcorn which is a win I guess. 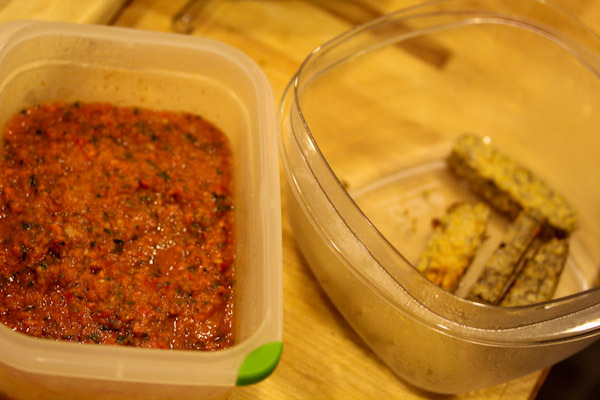 Cold tempeh was tasty with the raw marinara sauce. What is exciting is photography, or our attempts at it. 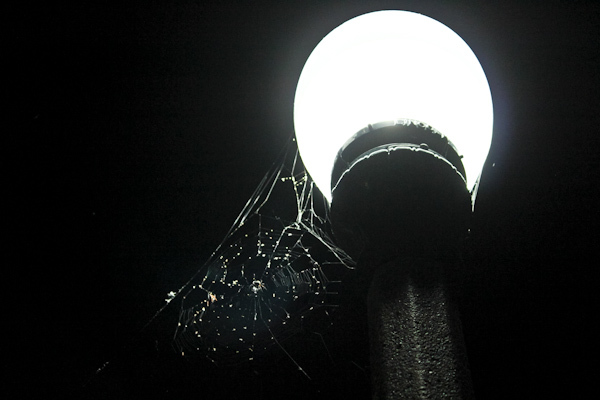 If you follow me on Instagram, you’ve probably been terrorized by a recent spider pic I posted. Sorry. I can’t help it though, I used to be terrified of spiders, but had to get over that fast when I moved back to California since they’re everywhere here and fun to snap. 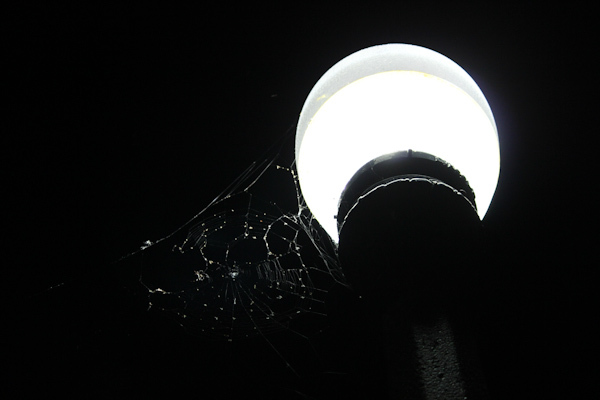 For the last few nights, I’ve been watching a huge spider perfect a web around one of our street lights checking the progress on runs and dog walks. Last night hubby tried to get pictures with our telephoto lens in the dark and he did pretty good. Not easy light conditions and it’s a little hard to see the giant spider in the center, but it’s about size of a golf ball. Neat, huh? Glad you got over your spider issues. I would have been repulsed with the food mixup, too. I am that way about garlic and onions. Like my reaction to those scents is so strong that it’s pretty much gag-worthy if I ask for something prepared with no garlic but they use it on my food…ummm…ick! And no matter what, that scent lingers in my nose for hours and there is no way I am eating that food, or even new food…just smelling it or it being on my plate, no! I’m sure some ppl think it’s weird but i am actually allergic to garlic and somewhat to onions and get really sick from them. Sorry about your situation…that’s not fair!! I feel the same way about the smell of over cooked, cheap mushrooms – the smell is absolutely repulsive, lingers, and kills my appetite.